This past week I had the privilege of being guided through Gettysburg by a friend who is passionate about Civil War history. As you may know, Gettysburg was the site of the greatest loss of human life on American soil in US military history. There were roughly 50,000 casualties in that little Pennsylvania Township in the heat of the summer between July 1 and 3, 1863. Every available building was turned into a hospital, including churches. Homes were destroyed, the landscape was bombarded by cannon fire, blood flowed like a river, and thousands of bodies and dead cattle were strewn throughout. 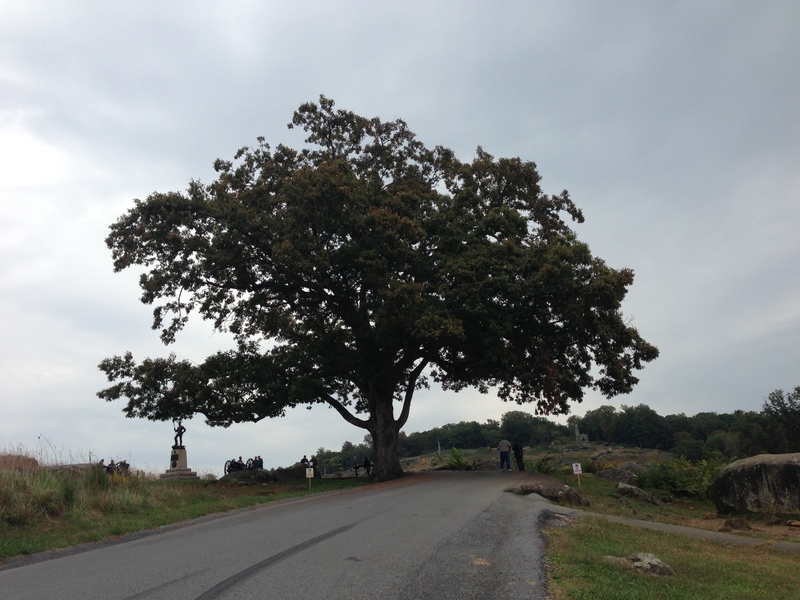 Throughout Gettysburg there are trees, including the one posted above, called Witness Trees, because they stood during that epic battle. Historians have identified these particular trees from pictures taken at the time. All the while, as the battle raged and men fought and died, they were there. And they stand today. I have been involved in a bible study with friends over the past few weeks, and together we are going through the book of Ecclesiastes. The whole subject of healing from past hurts came up in a circuitous way on Wednesday as we considered chapter three, that famous chapter put to music by Pete Seeger and made famous by the Byrds. The writer’s point was that everything has a season, but that God is eternal, and He has set eternity in the heart of man (verse 3). In other words, God is eternal and He has embedded this mysterious reality within us. In some way each of us is like a vast landscape on which much occurs. We experience battles, seasons of loss and gain, and if you are anything like me, some of these experiences are more difficult to get over than others. Some of my most tortured moments come when I wonder why certain things occurred, and why I couldn’t prevent them, or didn’t. In other words, I can get lost in something that was intended to be a season, because I treat it as though it is eternal. You get the picture. Hey, when we’ve been wounded, or if we have failed in some way, the hurt is real and our memories are sharp. But here is where we sometimes miss the storyline: None of this is meant to be eternal – only God is. I’m tempted to say that you don’t have to hold yourself in those broken patterns of guilt, shame, remorse and regret – and it is true, you don’t. But I want to put it this way: You are allowed to be free of them. You see I don’t think it is only about feeling as though we can’t break free, but that we don’t believe we are allowed to. But we are. We have permission to move on, even in the reality of things we will never be able to change, relationships we will never be able to fix and mistakes we will never be able to undo. There is such a thing as accepting responsibility, making whatever amends we can, living with consequences, and then moving on, because seasons weren’t intended to be mistaken for eternity. Deep down I think most of us tap back into the very human, but diabolical notion of thinking that if we have done something wrong, something bad should happen to us in return. It is really an arrogant expression of resentment over the reality of our imperfectness. But this just isn’t how the gospel works. The gospel reveals that the fall has happened to all of us – and we willfully act consistently with it. But Jesus has come. And He gives us permission, the power, and even the responsibility to rest in His work, and then thrive in His healing. By ‘finishing’ our redemption in His death and resurrection, The Eternal One who has entered into our time and space, has ensured that no unfinished reality that defines our past ever has to have the power to enslave us. This is the witness of Jesus, and it is our good news. You are currently reading Witness at unfinished1.